This week, my class and I learned about the Basics of Tissue Injury. There are four types of tissue: nervous, connective, muscle, and Epithelium. The nervous tissues create reactions throughout the body. The connective tissues store nutrients and protect our organs. Our organs are also supported with this tissue. Ligaments and tendons protect joints and bones (plus the muscles connected). The Muscle Tissues help with bodily movement. They move waste, food, and blood through the body organs and are even responsible for the body’s mechanical digestion (the action of chewing)! The Epithelium Tissues protect us from bacteria and other matter by being our skin! Our muscles in our stomach help absorb food and nutrients with these tissues. The kidney is an example of an Epithelium Tissue, it filters waste. Whenever you get an open wound, for example, a gash on your arm, you have to go through three stages of healing. Stage one is called Acute Inflammatory. In this stage, you have recently cut your arm. Your blood flows out of your cut to try to flush out any bacteria that entered your body through the opening. To help your blood clot, platelets carry blood clotting materials. Your white blood cells, leukocytes, help fight infections from your abrasions. To get rid of dead cells, Phagocytes eat them. This stage lasts about 2 days. Stage two is called Repair. Through this process, fibroblasts build fibers across the injury, slowly closing it and creating a scar. This stage can take from six weeks to three months. Stage three is named Remodeling. During this stage, tissue and ligaments build back to their original (or close to) strength. This can take up to a year or longer. You can tell that your wound is becoming inflammed by redness, heat, swelling, pain, and loss of function. These pictures are of stage one, Acute Inflammation. The white circles with “x”‘s as their eyes are the bacteria. 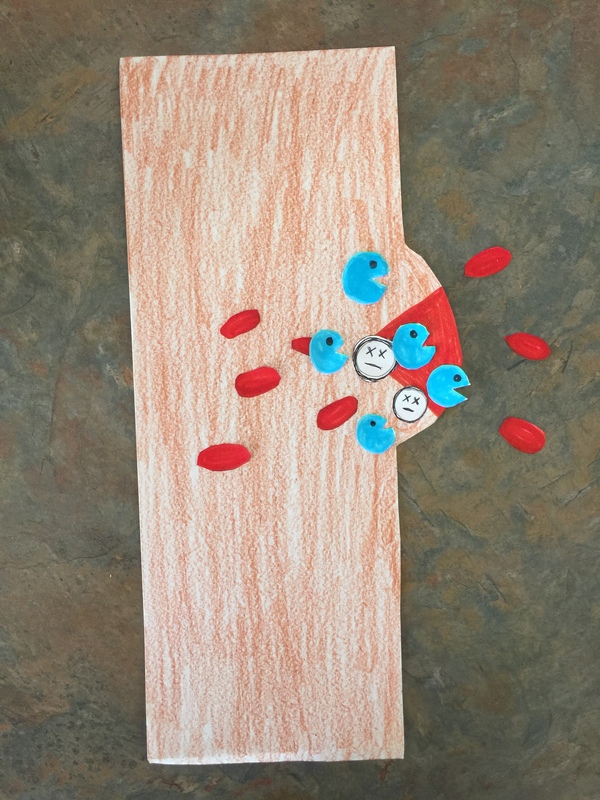 The blue pac mans are phagocytes, that eat up the dead cells.